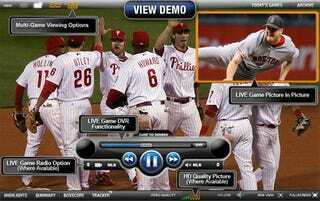 MLB's awesome and feature-packed iPhone app could be getting that killer feature—live video streaming—this summer thanks to a new streaming tool in iPhone 3.0, says MLB Advanced Media CEO Bob Bowman. If there were a heaven and it came out in midseason, maybe we offer a game or two a day and that way we don't drop the price for At Bat. We would love to do live games on the iPhone. I think people would watch. A whole game? Probably not. But ten minutes? Beyond that, MLB.TV is about to crush everyone's expectations of what live web video should be: More than 2,000 games in HD, which you can watch four of simultaneously with a mosaic picture-in-picture, multiple audio tracks to pick from and full DVR features like pause and rewind. They're also working on finally allowing in-market web streaming, so you can watch your local team online if you feel like it, not just on your TV.